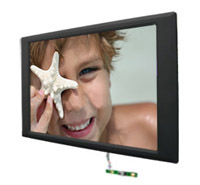 Winmate has developed an industrial grade Customized LCD TV product line. We have two standard housing types, panel mount and open frame for the Customized LCD TV. Panel mount LCD TV is with a sleek aluminum front bezel and open frame LCD TV is with an extremely versatile open-frame metal to be excellent for any space-constricted applications within a variety of different environments. The LCD TV set uses de-interlacing graphic processor and generate high resolution image than traditional TV set which has limited resolution. 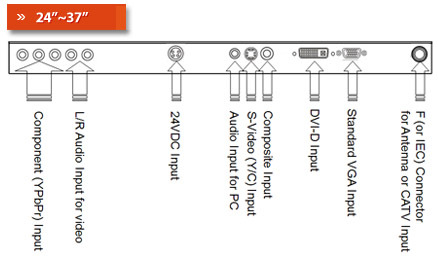 The LCD TV are compatible with NTSC or PAL analog TV system and equipped with VGA D-sub, DVI-D, Composite, S-video, audio inputs and OSD controller and infra red (IR) remote controller. 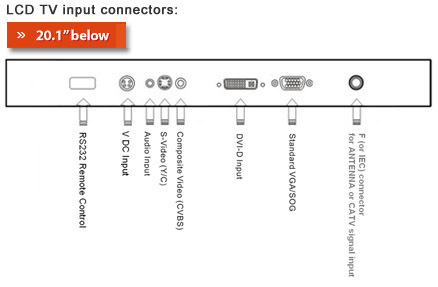 A component (YPbPr) input is available for 24"~42". 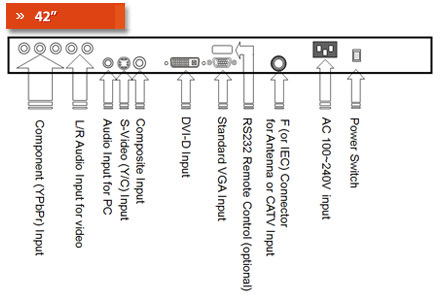 1x Component(YPbPr) Video Input (24"~42"
Adjustable TV function: MTS, TV/CATV, Auto Scan, Channel Memory, Channel Delete, Last Channel Recall, Timer for sleep, PIP, POP, aspect ratio changing, etc. The product combines many functions required and it is the best choice for customized applications.